This article is about the administrative county. For other uses, see Skåne (disambiguation). 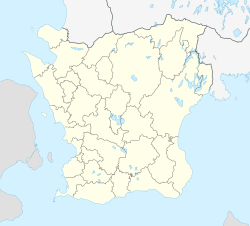 Skåne County (Swedish: Skåne län), sometimes referred to as Scania County in English, is the southernmost county or län, of Sweden, basically corresponding to the traditional province Skåne. It borders the counties of Halland, Kronoberg and Blekinge and connected to Capital Region, Denmark by the Oresund Bridge. The seat of residence for the Skåne Governor is the city of Malmö. The headquarters of Skåne Regional Council is the town of Kristianstad. In the 2018 general election, The Sweden Democrats SD performed particularly well in Skåne County, having the highest number of voters in 21 out of the county's 33 municipalities. The major ports of Skåne are Trelleborg, Ystad, Åhus, Copenhagen Malmö Port, Landskrona Harbour and Helsingborg Harbour. Ferry connections across the Baltic Sea operate from several smaller ports as well. ^ make_lan_03.pl. "SNA Länsfakta: Skåne län". www.sna.se. Retrieved 1 May 2018. ^ "Folkmängd i riket, län och kommuner 30 september 2017 och befolkningsförändringar 1 juli–30 september 2017. Totalt". Statistics Sweden. 2017-11-08. Archived from the original on 1 December 2017. Retrieved 2017-11-19. ^ "Home - SUBMARINER Network". www.submariner-network.eu. Retrieved 1 May 2018. ^ About Region Skåne Archived 2004-10-23 at Archive.today. Region Skåne. Retrieved 10 April 2008. ^ Board, County Administrative. "County Administrative Board". www.lansstyrelsen.se. Archived from the original on 2017-10-20. Retrieved 1 May 2018. ^ make_lan_html02.pl. "County of Skåne - Facts". www.sna.se. Archived from the original on 31 January 2013. Retrieved 1 May 2018. ^ "Contacting the Police - www.polisen.se". polisen.se. Retrieved 1 May 2018. ^ "Lund University". lu.se. Archived from the original on 15 November 2012. Retrieved 1 May 2018. ^ "Swedish Environmental Protection Agency" (PDF). naturvardsverket.se. Retrieved 1 May 2018. ^ "Malmo - Nordicnet.net". www.nordicnet.net. Retrieved 1 May 2018. ^ "ESMS : Malmo Sturup". www.airportnavfinder.com. Archived from the original on 28 August 2016. Retrieved 1 May 2018. ^ Region Skåne. Democracy-Increased autonomy Archived 2004-10-23 at Archive.today. Official site. Retrieved 24 August 2007. ^ Region Skåne.Municipalities in Skåne. Official site. Retrieved 24 August 2007. ^ Ljungbyhed airport - ESTL. Fact sheet created by Lund University School of Aviation. Retrieved 22 January 2007. Wikimedia Commons has media related to Skåne County.